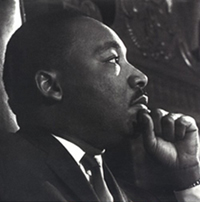 "Listening to a Vision" exposes students to the words and writings of Dr. King, and offers them an opportunity to reflect on his work at an appropriate level. "Breaking Color Barriers" is a science lesson that asks students to use the scientific method to illustrate that, while things may appear different on the outside, they're the same on the inside. "The Mathematical Montgomery Bus" offers students a chance to count passengers and fill a Montgomery bus. Mathematical Montgomery Bus - K-2 version. Mathematical Montgomery Bus - 3-4 version. They Had a Dream Too - This related research project may be used as a culminating activity for this unit, or as an independent unit.